Lemon juice contains about 6% of citric acid. It is what gives the lemons their distinctive taste. Lemons are also rich in vitamin C. Not just the colour, but everything about lemons spells freshness. So how can it be that lemons cannot induce that freshness on your face too?! The composition of lemon juice, especially citric acid that naturally bleaches, makes it an excellent remedy for any discolouration or pigmentation caused by scars, acne or sun damage. Why just the face, it can also be applied on the elbows and knees to get rid of the discolouration in those areas. So what are the ways in which lemon can be used to whiten the skin? Squeeze out the juice of half a lemon and apply this juice all over your face. If you find it too tingling or irritating, just apply it on the pigmented areas. Leave it to dry. Wash it off with some cool water and pat your skin dry. This method will help lighten your scars and also regulate the sebum that is produced by the skin. Less oil automatically makes your skin appear brighter. 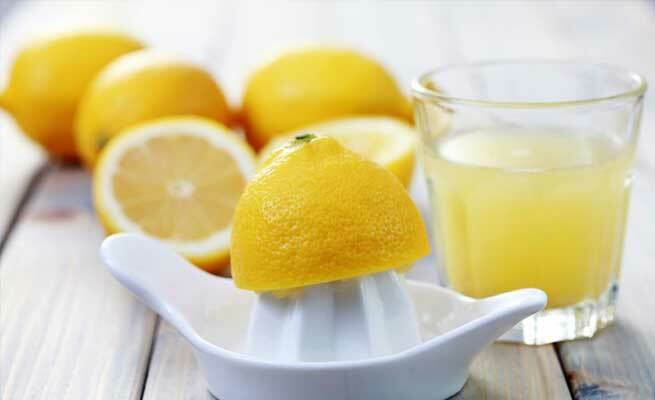 Leaving lemon juice on will also lighten the facial hair, thereby making you appear fairer. Before you use up the lemon for cooking, grate the rind out separately. Now just add a few drops of lemon juice to the same and use it as a facial scrub. This way, you are not wasting the lemon rinds and are also giving yourself a good scrub. Curd helps in treating blemishes, turmeric fights against the root cause of blemishes and lemon is a natural bleaching agent. When they come together, they guarantee a brighter and whiter skin. Mix one tsp of curd with the juice of half a lime and a pinch of turmeric. Wash your face and apply this mask on your face and rub it well into the skin. Leave it on for about fifteen minutes. Wipe with a wash cloth dipped in warm water. Follow up with a splash of cold water. Mix together a tsp of sugar with the juice of half a lemon and half a tsp of honey. Both lemon and honey are whitening agents. The sugar crystals help in exfoliating the skin and getting rid of the top layer of dead skin. Dampen your skin and scrub your skin with the home made scrub. Leave it on for about five minutes and wash it off with warm water. Doing this twice a week will give you blemish free lighter skin. Mix one tsp of sandalwood powder with a few drops of lemon juice and a few drops of cucumber juice. Apply this paste on your cleansed face. Leave it on to dry for about fifteen minutes. Wash it off with some cold water and dab your face dry. The sandalwood is a natural complexion improver. Lemon and cucumber juice also help in lightening the skin.